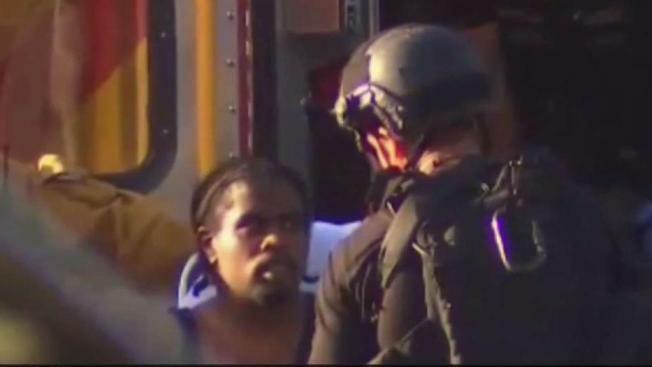 Gene Atkins, 28, is accused of shooting his grandmother and girlfriend, leading police on a car chase, then crashing into the busy Silver Lake supermarket where he held dozens of people hostage in an hourslong standoff with the police. One woman, Trader Joe's manager Melyda "Mely" Maricela Corado, was killed in a shootout between police and the suspect at the conclusion of the police pursuit. Atkins remains hospitalized. Charleo Egland, first cousin of the suspect, lives right next door to the house where Atkins allegedly shot his 78-year-old grandmother, Mary Madison, on Saturday. Atkins was living with his grandmother at the time of the attack, Egland said. Egland said Atkins' life was in shambles, as he had lost his job and two cars recently. "The last thing he told me was, 'The next thing I do, I'm going to die doing it or I'm going to jail,'" Egland said. The argument between Atkins and his grandmother started over his girlfriend being in the house along with problems over the TV, the cousins said. "Not in my wildest dreams did I ever think this would happen," said Linda Brown, another cousin of Atkins. Both Brown and Egland said Atkins was withdrawn and quiet, preferring to stay inside the house and watch TV. Atkins had been in and out of mental facilities since childhood, according to Egland. "I believe he is suffering from a mental illness," said Egland. "He's not the same from when we were growing up. He changed. I don't know if it has something to do with his mom passing away because she died four years ago." A pursuit ended with a crash and gunfire in front of a Los Angeles Trader Joe's. The suspect fled into the supermarket and was later taken into custody. Authorities say one woman was killed at the store. Atkins had lived with his grandmother since he was around 9, according to family members. However, Saturday was not the first instance of violence by Atkins against his grandmother. Egland said Atkins had smashed the windows in his grandmother's house and slashed her tires. Mary Madison is said to be recovering after her surgery at USC Hosptial. Atkin's girlfriend was grazed by a bullet and is expected to be OK.